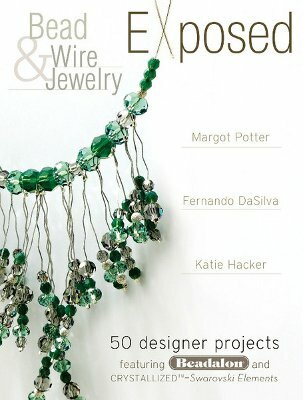 Get an inside look at bead and wire jewelry design secrets from the experts when you peruse the pages of Bead & Wire Jewelry Exposed, a stunning collection of unique and unexpected jewelry projects from veritable masters of the art. A collaborative effort from craft gurus Margot Potter, Fernando DaSilva, and Katie Hacker, this extensive jewelry making guide book is a collection of 50 fabulous designer projects that explore new territory on the bead and wire jewelry making terrain. This is bead and wire jewelry like you've never seen it done before. If you're tired of the same humdrum beading patterns and wire-wrapping tutorials and are looking for a new challenge, the projects of Bead & Wire Jewelry Exposed will come as a breath of fresh air. There's nothing obvious, expected, or typical about these jewelry designs. Potter, DaSilva, and Hacker have created projects that take usual supporting role players, like memory wire and cone ends, and put them center stage. Wire becomes the star of the show as it cascades in strands from projects like the Fire & Spice and the Fireworks necklaces, and cone ends are put on full display in projects like the Cascade earrings and the Evening Topaz necklace. The 144 color pages of this epic jewelry project book are pure bliss for jewelry crafters and designers. Find jewelry projects featuring colored wire, metallic wire, crinkle wire, memory wire, secondary materials, chain and tassels, tubing, leather, silk, and more. You'll delight in these innovative designs and find endless inspiration from the 50 full-color, step-by-step, pictured project tutorials. If jewelry-making is your art of choice, this is a project book you want in your collection.